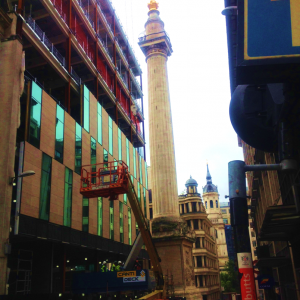 The Monument Building in the heart of the City of London is one of the current projects to use Bull Products latest Cygnus wireless alarm system during construction works. Standing adjacent to The Monument, which marks the origin of the Great Fire of London, the new project being built by leading construction group Skanska, is a building which will comprise 94,000sqft, offering 88,000sqft of office accommodation with 4,000sqft of retail space. Designed by architect Ken Shuttleworth’s Make, the office accommodation is split over 10 floors with terraces at several levels. The Monument Building is designed to achieve a BREEAM ‘Excellent’ rating and is scheduled for completion in Spring 2016. Skanska has been using the Bull Products system since construction started last year. The construction group recognised the benefits of the Cygnus wireless alarm system and specified some 26 units for installation across all 10 floors of the building project. The Cygnus alarm system can link as many as 480 alarm and detector units in different zones on a construction site, and individual units can be fire alarm call points, first aid alerts, combined call points and first aid alerts, smoke detectors or heat detectors. Claire is also impressed with the flexible service that Bull Products provides, commenting: “As the whole system is reusable on future construction projects, it is a very sound investment and financially much better than hiring. Also by purchasing the Cygnus system, Bull Products hold the units in stock on our behalf for us to call off when we require, and they also maintain the system for us”.